“There are overarching narratives, and then there are people just trying to live their lives within them.” Does COP21 speak to the most vulnerable people trying to survive climate change now? What does COP21 say to small islands? The BBC, in its short video rather distastefully titled ‘COP21: Climate change deal’s winners and losers’, describes the Paris Agreement as a “win” for small island states. This is because limiting the temperature rise to 1.5C above pre-industrial levels is mentioned as an aspiration in the Agreement text. However, 2.0C is the actual goal of the Paris Agreement, and in reality individual countries’ emission targets (the Intended National Determined Contributions (INDCs)) – which are not even legally binding – would result in a 2.7C rise. 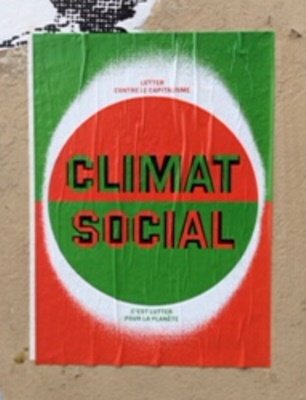 "Fighting against capitalism is fighting for the planet," poster on Paris street druing COP21. The strains of Vilakazi’s refrain on my mind, I wonder at the close of COP21: what will we say about the Paris Agreement to a pacific islander? Ursula Rakova is a leader, campaigner and human rights advocate from the matrilineal community from the Carteret Atoll. Due to rising sea levels the livelihood of islanders has had to change over the past 40 years, as certain crops can no longer grow or survive. Rakova has been organising the migration of the island’s 2,700 people since 2009, because it is expected that the sinking island will be completely uninhabitable by 2020 - the year the Paris Agreement will be implemented; states have until then to ‘peak’ their emissions before starting to reduce them. On 10 December, two days before the Paris Agreement was secured, Rakova explained to a COP21 Human Rights Day side event, “we don’t want to be known as victims of climate change.” Yet this is the ‘overarching narrative’ which they have been bequeathed by those who extract fossil fuels, emit carbon, and negotiate to limit the after-effects of their extractavism and excess from a future date. COP21 President and French Foreign Minister Laurent Fabius called the Paris Agreement “balanced,” but I do not see how he could justify this adjective to an islander-turned-climate refugee who cannot even hope to return to their homeland. What does COP21 say to women? On 7th December, the Women’s Earth and Climate Action Network (WECAN) held a gathering of worldwide women leaders to make the case that in order to attain climate justice, women must be at the forefront of envisioning and implementing solutions to climate change. With Vilakazi’s poem ticking through our minds, again, we might ask: what will we say to women about the Paris Agreement? COP7 was held in Marrakech in 2001, and it was recognised during that negotiation that women’s participation would need to be improved. Women are half of the world’s population and are most affected by climate change: Research by WECAN indicates that that 80% of ‘climate refugees’ are women, and the intersection between gender and poverty makes women doubly affected. But 14 years after COP7, women’s representation on UNFCC bodies and boards is only between 36%-41% – and merely 26%-33% of national delegations are headed by women. Titilope Akosa and her colleagues from the United Nations Framework Convention for Climate Change (UNFCCC) Women and Gender Constituency pressured COP21 delegates both inside and outside of the negotiations to include human rights in the Paris Agreement. Akosa emphasised at WECAN’s event that the inclusion of human rights would ensure “that women’s voices are reflected” both in the agreement itself and future planning for the effects of climate change. Human rights are not part of the core text of the Paris Agreement, however. What does COP21 say of our humanity? I previously wrote about the balance and dependency between human beings, other species and nature, when reporting on the International Rights of Nature Tribunal. In this context it is also difficult not to see Fabius’s comment as a subversion of the term. In fact he refers to trading off interests and compromising worldwide security. It is also a reminder that the borders which separate the nation states represented at COP21 are not recognised by the natural world; so to talk about ‘winners and losers,’ as though there is an equilibrium in compromise, is nonsensical because loss affects us all. Casey Camp-Horinek, from the Ponca Nation in Oklahoma, challenged the WECAN gathering, “What is power? Is it COP?” She contended that we need a shift in our collective mindset to reimagine and reconstruct power dynamics. She explained the ‘seven-generation philosophy’: that “with every step you take” you remember the seven generations who have come before you, and the seven generations to come. The following day Camp-Horinek insisted, “We are the United Nations, sitting in front of you – we have earned that right, because we have cared for those coming behind us and we will continue to.” Away from the trade-offs and ‘balanced’ bureaucracy of COP21, the women leaders offer an alternative model of diplomacy. Their model is not about compromise, but connection. Declaration of the Rights of Mother Earth poster at COP21. Pennie Opal Plant presented the Indigenous Women of the Americas – Defenders of Mother Earth Treaty to the WECAN gathering on 7th December. The treaty is being extended to Indigenous women across the world, and in 2016 non-Indigenous supporters will also be encouraged to sign it. “There is nothing more intolerable than the destruction of thousands of species, including our own,” said Plant, and she encouraged us to channel our outrage into forming alliances, educating ourselves and other women about the planet, the harm being done to it, and those causing the harm (“those people in COP!”). Yes, women on the frontlines of climate change need to be where decision-makers are. But if decision-makers will not listen to them, or share power, it will not stop these women leading to provide real, liveable solutions to man-made problems. On the weekend that the Paris Agreement was announced and COP21 came to a close, Indigenous women led an action in Paris outlining their own ‘red lines’ for climate change: keeping fossil fuels in the ground, a clean energy economy, a 1.5C maximum limit, and an end to climate crimes to which they and their families (including Mother Earth) fall first victim. These women will continue connecting with others, educating, surviving, and taking direct action to claim the human rights which inherently belong to all people but which the core text of the Paris Agreement does not mention. Those of us who feel disappointed with the grand narrative COP21 paints for humanity can look to them for alternative, real-life leadership. The Paris Agreement might not have the words to speak to us, but these women do. This is the third article in a short series by the author reporting from COP21 for openDemocracy 50.50. Read the first and second article.